Stana attended the premiere of “The Rendezvous” at Mill Valley Film Festival, along with some of her co-stars and crew from the film. As we can see from one of the videos below, she didn’t stay for the Q&A panel because she was going out to celebrate her husband’s birthday. You can find photos in the gallery, thanks to everyone who was kind enough to share the ones they took! Amin Matalqa has confirmed that ‘The Rendezvous’ will premiere at Mill Valley Film Festival on October 8th. You can visit their website to purchase tickets. I’ve also added two HQ stills and one HQ BTS photo to our gallery. I’ve updated the gallery with additional behind the scenes photos of Stana filming The Rendezvous. Credit to Nicolas Dollander. Most people who get time off from work use it relax. 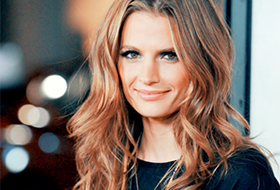 Since she’s been starring as detective Kate Beckett on the ABC hit show Castle, actress Stana Katic has a tendency to use her hiatus time between seasons to go do another acting job. For the Castle 2015 hiatus, she used it to do two: The Rendezvous and Sister Cities. Read on to see how these projects fit into the still rising trajectory of this talented & beautiful star. (…)Artistic processes are all about making choices all the time, and the very act of making a choice is the distilling down and the getting to the core of what it is that you care about and what you want to say, really. The above quote is from five time Oscar-nominated writer and director Mike Leigh. This idea of actors making choices in what roles they do may sound unlikely to some. Don’t actors – especially early on – just take what they can get? Well, yes and no. In terms of what auditions come their way an actor has no control over it. However, even early in the game an actor makes decisions on what they will audition for. (For more on actors choosing roles:www.backstage.com – advice for actors ). What strikes me about the Katic resume is that there aren’t any roles where she’s just there as eye-candy – and there’s no doubt she’s beautiful enough to play any number of roles that require nothing but the ability to be hot on film. This speaks to the choices Katic didn’t make when going to audition and makes what she did do a snapshot of what’s been important to her early on as an actress. In examining her body of acting work and her public persona, one can see Katic doing exactly as Leigh describes. Her work shows a steadily building arc that gives a picture of her not only as an actress, but of her larger artistic sensibility and spirit. These two new projects fit right into this arc, and appear to be creating a point that will allow more of who she is as an actress to shine. Let’s look at the roles she’s doing in the first of these new projects. EXCLUSIVE: Stana Katic (Castle) and Raza Jaffrey (Homeland) will star in Sundance award-winning director Amin Matalqa’s action adventure The Rendezvous. Inspired by classic romantic capers as North By Northwest and Romancing The Stone, the film is an adaptation of Sarah Isaias’ book A New Song. Set in Jordan, the film recently wrapped principal photography on location there. Terrel Seltzer (One Fine Day) has written the script, which follows an unlikely pair who find themselves swept up in a deadly race to find a sacred Dead Sea Scroll hidden in the ancient city of Petra. The film is produced by Dan Halsted (Garden State) and Tricia Gibbs. Amanda Rohlke is exec producing. Alfonso Bassave, Ron Guttman, Glenn Fleshler, Darby Stanchfield, and Nadim Sawalha round out the cast. 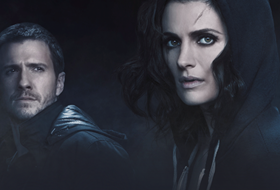 Stana Katic and Raza Jaffrey are repped by Gersh/ Principal Entertainment LA. Matalqa, who is of Jordanian descent, has proven himself to be a prolific filmmaker and one equally comfortable in Hollywood and the Arab world. He directed Disney’s first (and only) Arabic language feature The United in 2012 to follow on from his debut Captain Abu Raed, which won the World Cinema Audience Award at Sundance. He is also a participant in Disney/ABC’s 2014-2016 Directing Program, which offers an extensive series of seminars and mentoring sessions with the goal of nurturing promising directing talent among industry pros. Stana shared the name of the movie she worked on over the summer, and we can finally announce that the official name of the movie is The Rendezvous. The film was shot in Jordan over the summer, with some final scenes being shot in Los Angeles, and begins post production soon. Thanks to the director Amin Matalqa, we also have some other information. He states that it’s an American film but that everyone will have access to see it. The film has drama, comedy, suspense, and action all brilliantly balanced by Stana and the cast, which include Raza Jaffrey, Meghann Cionni and Alfonso Bavasse. He says that fans of Stana will be extremely happy because this is HER movie and she is AMAZING. You can follow @AminMatalqa on twitter to receive the latest information. I’ve added some behind the scenes photos that members of the cast and crew have shared online over the past few weeks, which you can find at the link below. In a post on Stana’s instagram yesterday, she said she begins rehearsals for a new film on Monday, so hopefully we get more information about that soon. We also know that Castle begins filming Season 8 on July 15th, so she’s definitely keeping herself busy this year!